It all takes place on our 8 acre organic Cedar Spring Farm, dedicated to providing living and learning experiences of NVC and living in harmony with nature . The Farm is transformed into Family Camp Village in May and June..Family Camp's organic kitchen garden is planted, hay is cut, tipis go up, the outdoor kitchen and dining halls emerge, Kid's World bursts forth, Rumi's field welcomes big games. By the time camp starts in August, we've got a whole farm village ready to support families having fun, connecting, learning, loving and growing together! Vashon Island is a rural, green, magical island, located in the middle of glimmering Puget Sound, a 20 minute ferry ride from Seattle. Cedar Spring Farm is an 8 acre intentional farm envisioned by Doug and Barbara ten years ago to be a center of living and learning of NVC and sustainable practices that will contribute to a world that works for everyone. Family Camp has been lovingly held here for 8 of it's 10 years. Before that, the land was held by Doug's family for 4 generations. Please plan to arrive at the Cedar Spring Farm between 2 PM and 5 PM on Saturday, July 28. You will get to negotiate a ferry to Vashon Island from either Tacoma (Pt. Defiance) or West Seattle (Fauntleroy) or from the Kitsap Peninsula (Southworth). 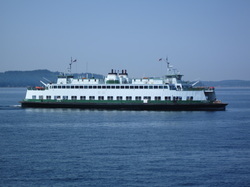 Southworth and Fauntleroy ferries arrive at the same terminal on the north end of Vashon Island. An evening meal will be served at about 6:00 PM, and a Community Welcome Ceremony will follow that. TRAVEL FROM I-5, INCLUDING THOSE COMING FROM THE EAST ON I-90. Use your phone or on-board navigation system!!! Coming from the north on I-5 (Canada AND including those of you arriving from Eastern Washington on I-90 who will want to get off I-90 onto I-5 SOUTHBOUND and move immediately into a right-hand lane), exit onto the Spokane Street/West Seattle Freeway (exit 163A). Once on Cove Rd., head west for about 1.5 miles. Turn RIGHT (north) At 121st. Follow 121st to WESTSIDE HIGHWAY. Continue north (yes, you've made a big U-turn and you're headed back toward the ferry. Crazy huh?) Once on Westside Hwy, travel about 0.7 and turn RIGHT (east) on 148th. Go up the hill about 500 feet and turn LEFT into the driveway. We'll have signs out for you to mark the correct driveway. Hwy 101 to Highway 16. Exit 16 on Sedgewick Road. Follow all the way to the SOUTHWORTH ferry terminal. Arrive at least 5 minutes before ferry departure or the ferry workers won't load you for reasons that are not entirely clear to me. 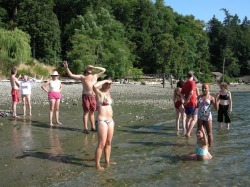 Once on the Island, follow the directions given to the people coming from Fauntleroy (W. Seattle) as they are the same. From north or south I-5: Take exit 132 (Hwy 16). Proceed west on Hwy 16 approximately 3 miles and exit on the 6th Avenue exit (signed Vashon Ferry). Turn left (west) onto 6th Avenue at the stop light. Turn right (north) at the next stop light onto Hwy 163 (Pearl Street). Proceed north, approximately 3.5 miles, to the stop sign at the entrance to Pt. Defiance Park. Stay in the right lane and bear to the right. Do not enter the park. Auto toll booth is one block ahead. Ferry terminal is located at end of street. Once on Vashon Island, follow traffic up hill on Vashon Highway SW. Go through (count 'em) 4, four-way stops. The fourth one is the town of Vashon. Continue north about a mile and TURN LEFT (west) ONTO COVE ROAD. Once on Cove Rd., head west for about 1.5 miles. Turn RIGHT (north) At 121st. Follow 121st to WESTSIDE HIGHWAY. Continue north (yes, you've made a big U-turn and you're headed back toward the ferry. Once on Westside Hwy, travel about 0.7 and turn RIGHT (east) on 148th. Go up the hill about 500 feet and turn LEFT into the driveway. We'll have signs out for you to mark the correct driveway.